Jobs at Singapore Airlines in Singapore. Singapore Airlines Limited is Singapore's flagship airline which is based at Changi Airport. There are many subsidiaries of this airline, with its engineering division handling repair, overhaul and maintenance across 9 countries worldwide. Singapore Airlines also has a cargo arm which operates freighter aircraft and there are also two subsidiary airlines, with Scoot operating as a low cost airline and SilkAir operating regional flights. Singapore Airlines is in the top 15 carriers in the world in terms of passenger revenue and is 10th in the world for the number of international passengers it carries. It is also the second biggest global airline in terms of market capitalization. As you can imagine, this is a very prestigious employer which offers workers a host of excellent career opportunities across a number of different sectors. 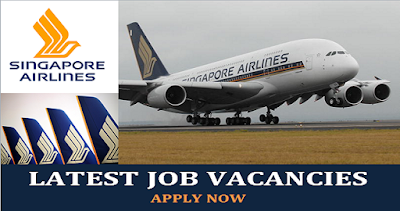 If you are interested in finding out more about jobs at Singapore Airlines in Singapore, read on and learn about how to find out about the latest vacancies and how to make your application. Singapore Airlines offers a very wide range of job opportunities designed to appeal to applicants at all stages of their career. From entry level posts suited to those who have just left education who have minimal experience to senior management roles which require industry specific qualifications and extensive experience in a similar field, there are both permanent and temporary positions as well as full time and part time jobs to suit the needs of a wide breadth of candidates. There is also a scholarships and internships program aimed at those who are interested in developing their skills with a view to progressing up the career ladder in the aviation industry. Why Work For Singapore Airlines? Singapore Airlines offers its workers a number of advantageous benefits which not only include a competitive salary, excellent working conditions and a generous holiday entitlement, but also includes excellent travel benefits. Employees are given a free ticket for themselves and their family once per year to travel to any destination on the Singapore Airlines network as well as discounts on travel at any time of the year on top of this perk. There are also profit sharing bonuses and medical insurance benefits to enjoy. If you are looking for the perfect job with Singapore Airlines, the first place to begin your search is on the airline's own website. Here you will find a dedicated careers page which lists all of the available posts at the current time. Here, you can scroll through all of the openings, seeing at a glance where they are based and the job title so that you can quickly identify which roles are relevant to your skills, location and experience. If you spot a job with Singapore Airlines that you are interested in applying for, you can do this quickly and easily by using the online system. Simply select the job title that you want to apply for, check that you meet all of the relevant criteria for application and then click on the Apply tab. If you are a new applicant, you can upload your current resume and fill in your details and then your application will be submitted to the recruitment team for perusal.